The last post to this blog ended with the following sentence. 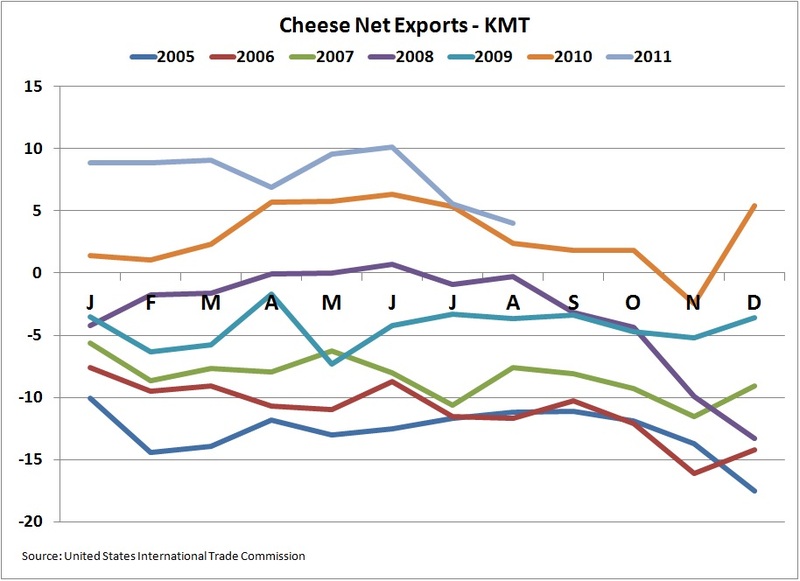 "With Cheese inventories falling and a strong export program in place, cheese prices should slowly gain for the remainder of 2011, with a similar impact on milk prices." The November Class and Component prices were announced on December 2. 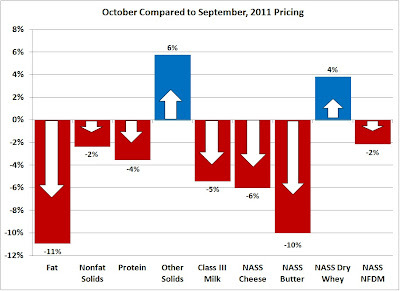 Class III milk prices gained 6% reaching $19.07/cwt based on the strength of the current cheese prices. Milk protein increased 11% to $3.23/lb. 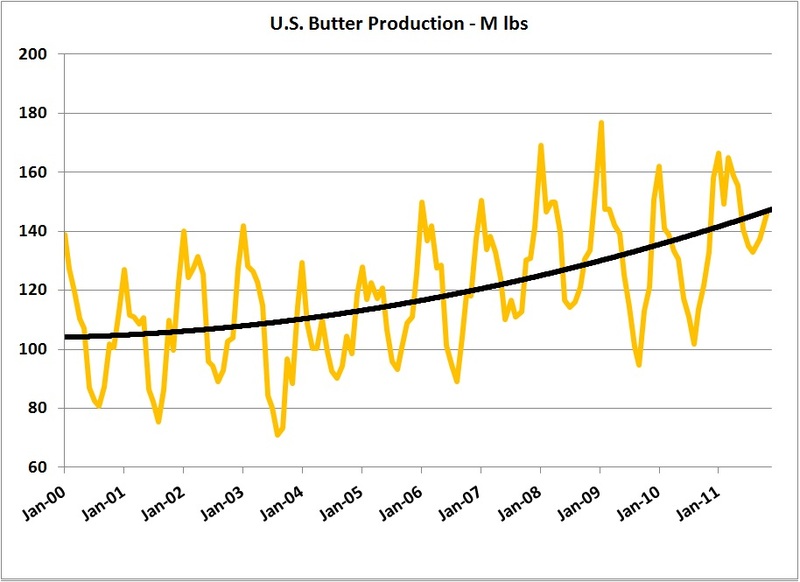 Butterfat fell slightly but remained above historical levels, paying $1.95/lb, well above the historic level of $1.50/lb. 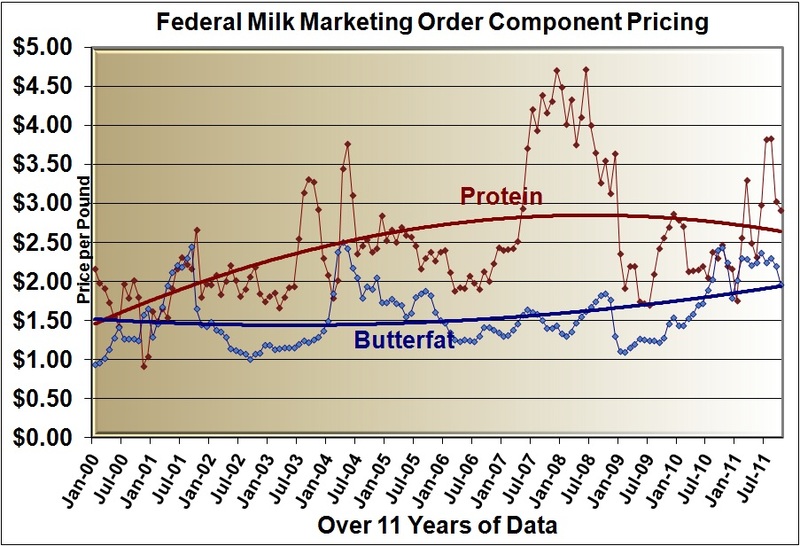 Milk protein returned to more normal prices, well above the price of butterfat. This has brought the breakdown of the milk check back to a more normal relationship where protein makes up the majority of the paycheck. 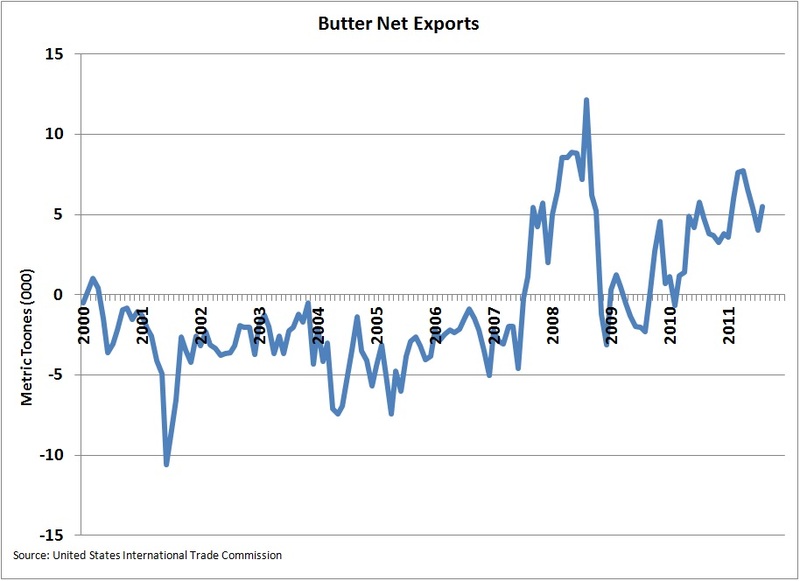 Inventories of cheese and butter returned to more appropriate levels which has in turn brought prices to a more normal relationship. 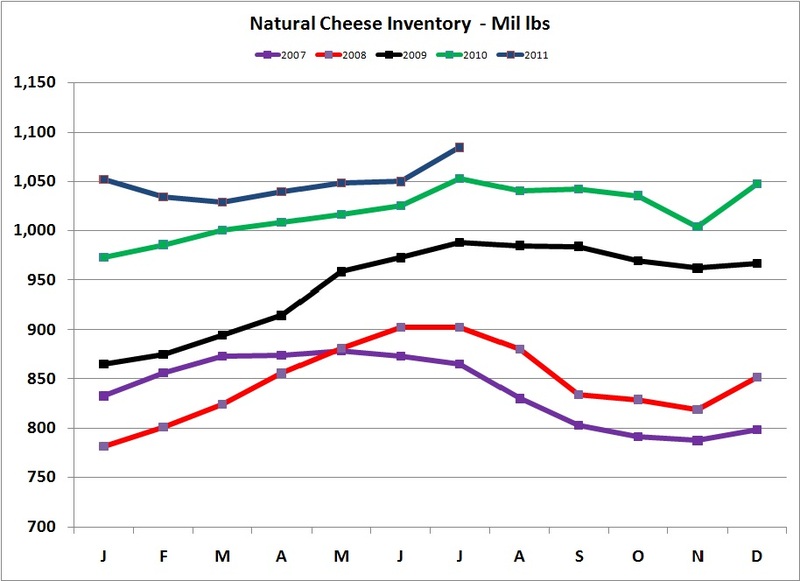 Cheese inventories fell below prior year levels while remaining high compared to historic levels. Lower inventories typically bring higher prices. January is typically the low point in the annual pattern, and with two months to go, it is likely that upcoming levels will fall below the trend line. 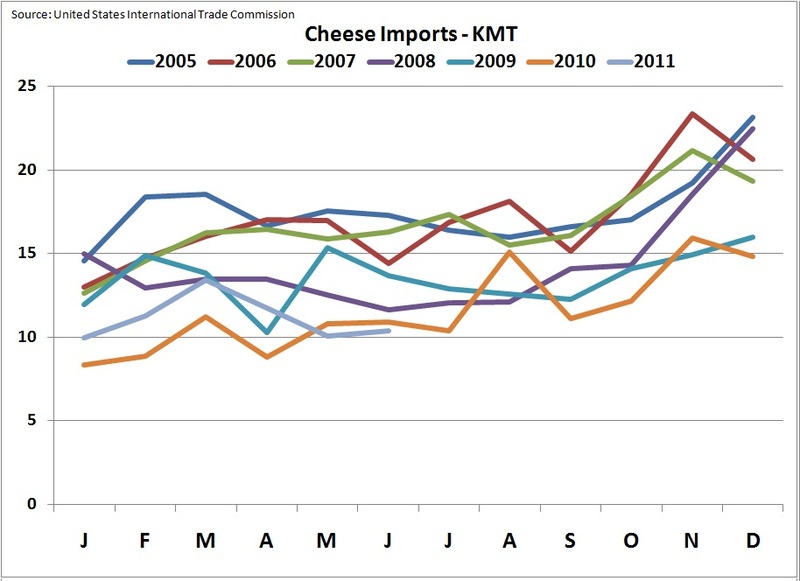 This did not happen in January 2010 or 2011, and should position the U.S. market for a good 2012. 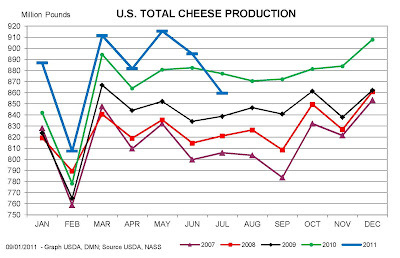 This has been accomplished by a very significant drop off in cheese production. 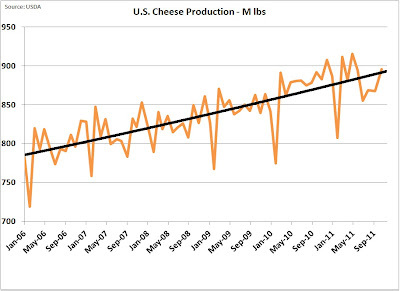 For the last six months, cheese production was well below the comparable 2010 production. Reduced production, combined with continuing good trends in exports, support the reported statistics for the lower inventories. 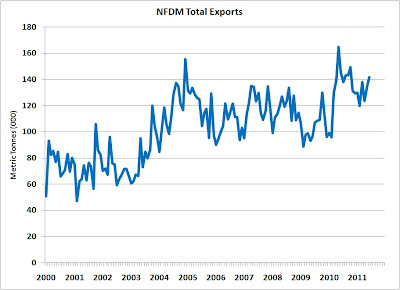 Exports were a record for the month of September, the latest reporting period. 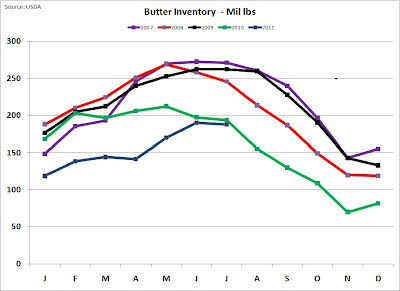 Butter inventories have been very tight for over one year. 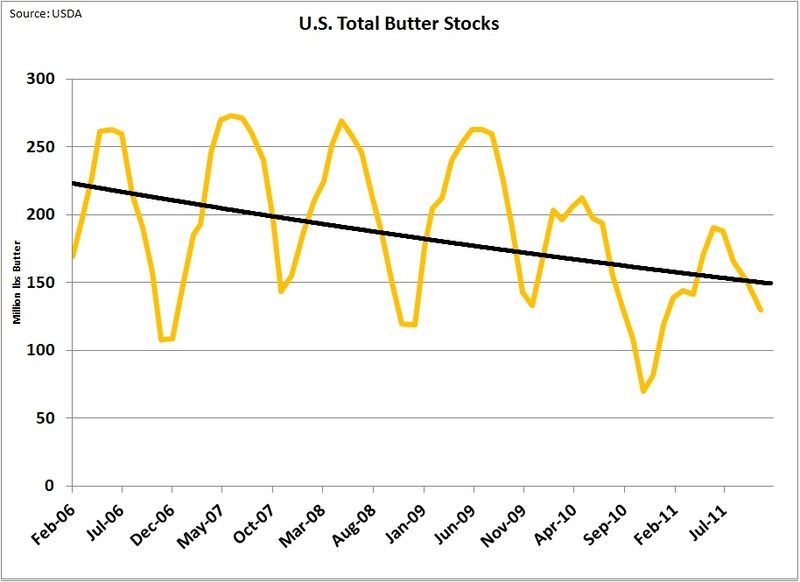 The low inventory levels have brought high butter prices during this period of time. 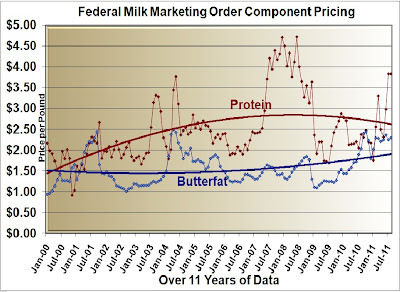 High butter prices have almost no impact on the Class III milk price. In the last three months we have seen an increase in inventory levels above 2010 levels. 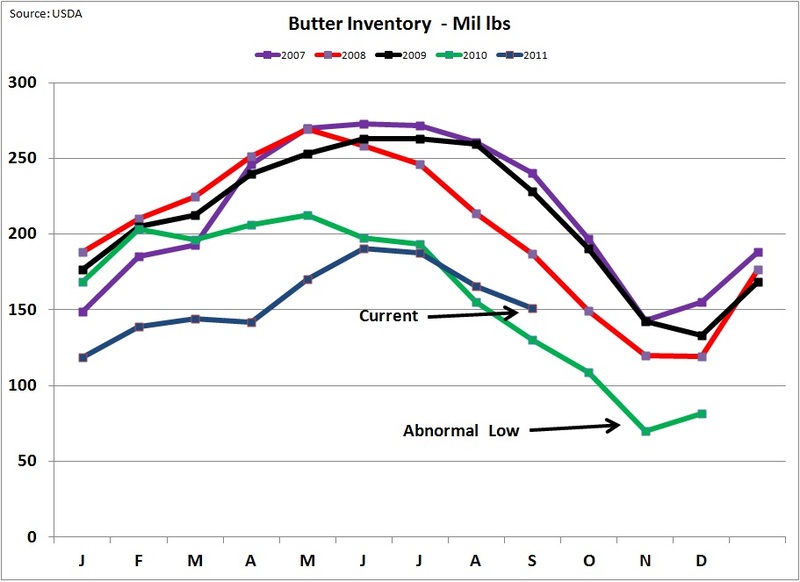 November is typically a cyclical low for butter inventories, and the November 2011 inventory is well above the November 2010 level, substantiating the correction in inventory levels. 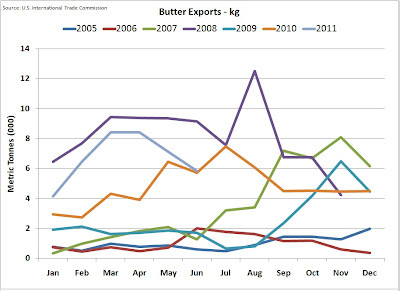 Butter production has recovered from the low points of 2009 and 2010 helping to replenish stocks. 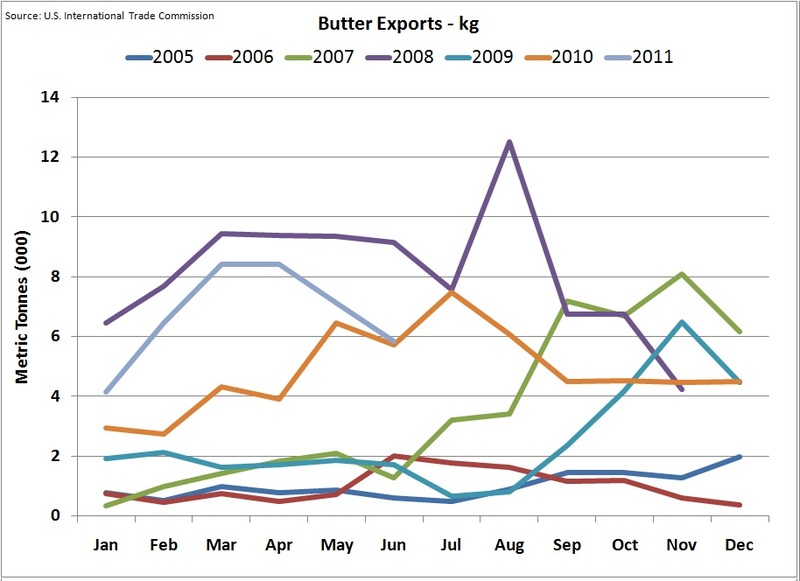 Butter exports are low compared to the last 4 years also contributing to the recovery in inventories. 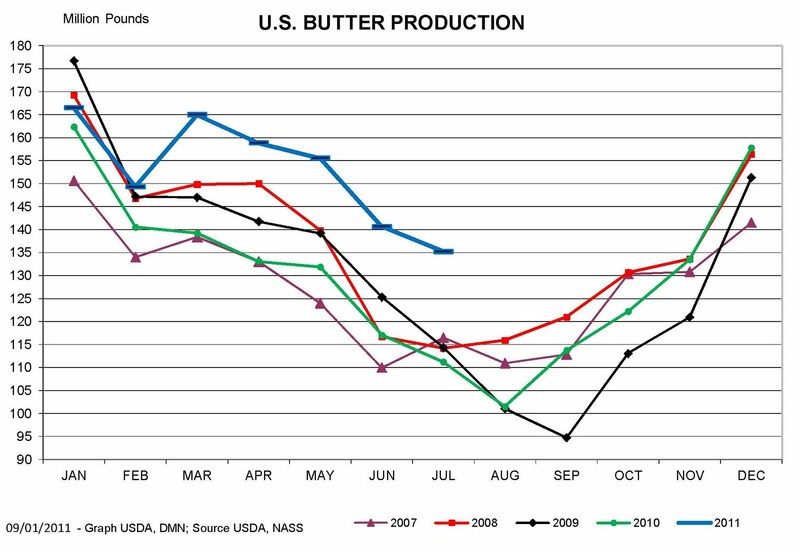 The production, exports, and inventories of butter and cheese all seem to be going in the right directions to provide a stable and level field for good component pricing. The only near term cloud on the horizon is exchange rates. The U.S. Dollar has gained respect and strengthened against other currencies. While we can take pride in this, it does make our dairy products higher priced and can therefore have the potential to reduce exports. While nothing lasts long in today's volatile world, we could not ask for better current prices and trends. Let's enjoy them while they last. 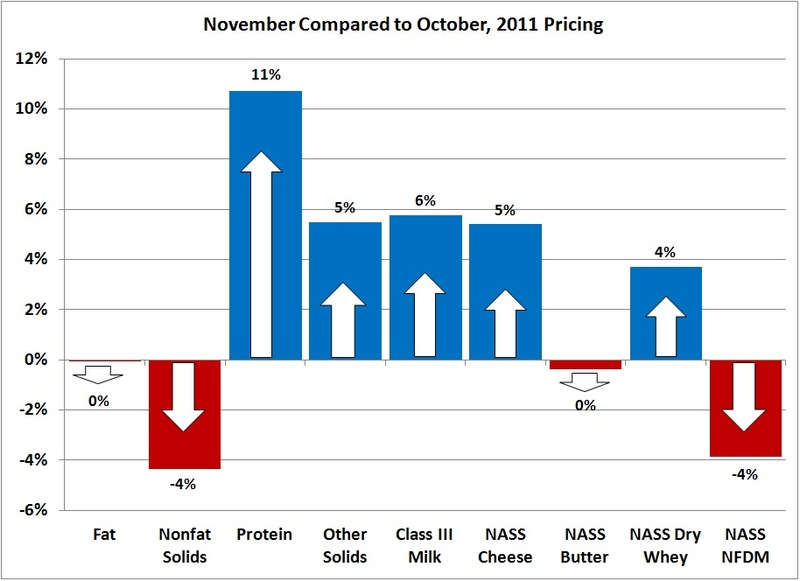 The October Class III milk and component prices were released November 4. The posted format is a little different this month, but the same information is in the report. 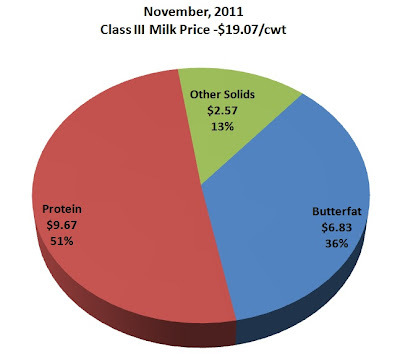 Class III milk was announced at $18.03/cwt with butterfat at $1.96/lb and milk protein at $2.92/lb. The Dashboard shows a lot of red as most of the prices fell as predicted in this blog last month. 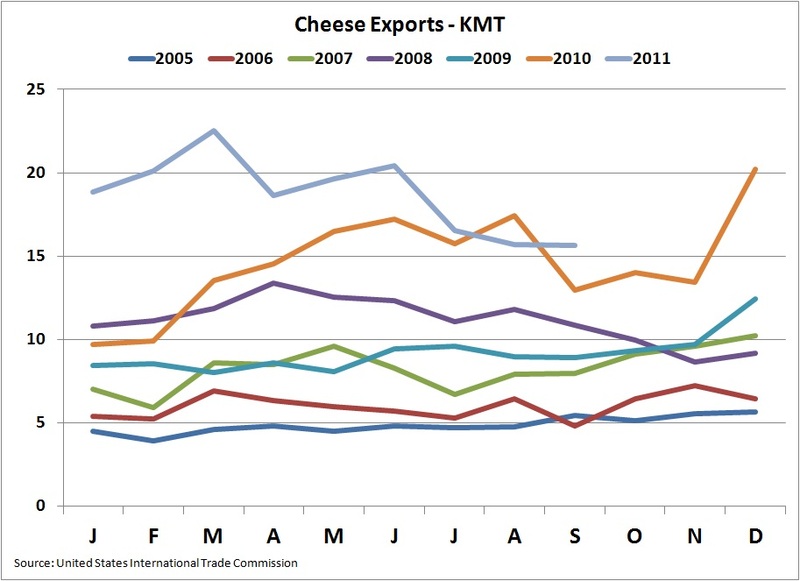 It's hard to ignore falling cheese prices as they will have a direct impact on Class III milk prices. 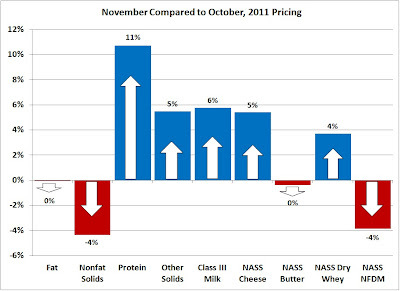 The only gainers for the month were Dry Whey prices and Other Solids which are linked to Dry Whey prices. 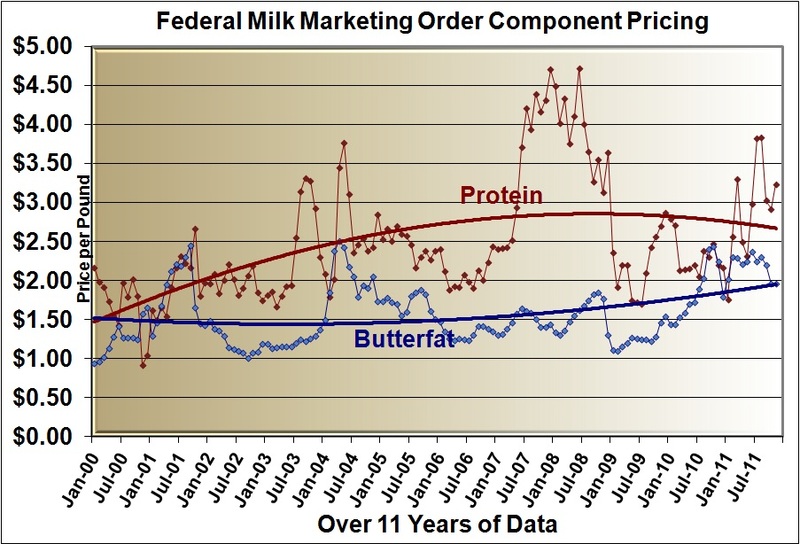 Although lower, it has brought the long term protein and butterfat prices more in line with their historical trends. 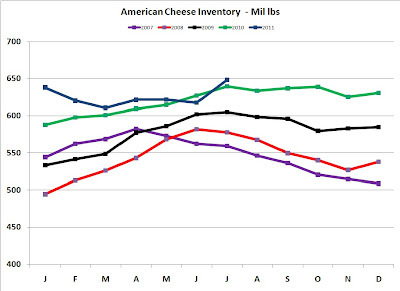 Inventories seem to be recovering for both cheese and butter. 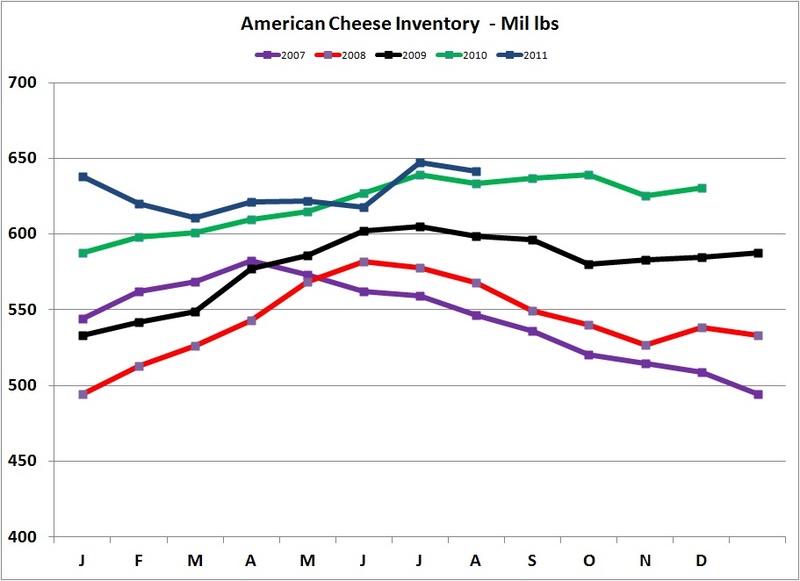 Inventories will be explored later in this blog post. With the October prices, the milk check has returned to a more normal ratio with milk protein payment making up the biggest slice of the milk check. For the second month is a row, butter inventories have exceeded the 2010 level. 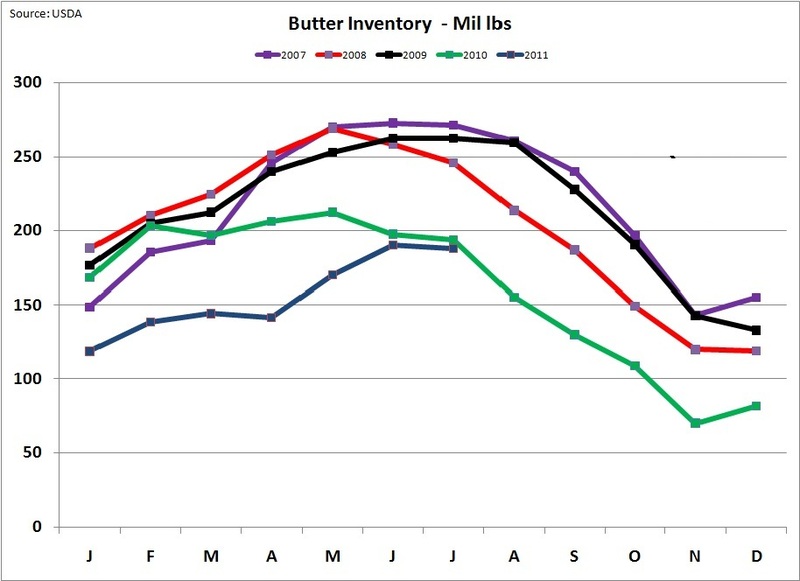 If this trend continues, by November the 2011 level may surpass the 2009 level and by year end, butter inventories will be back to normal levels. 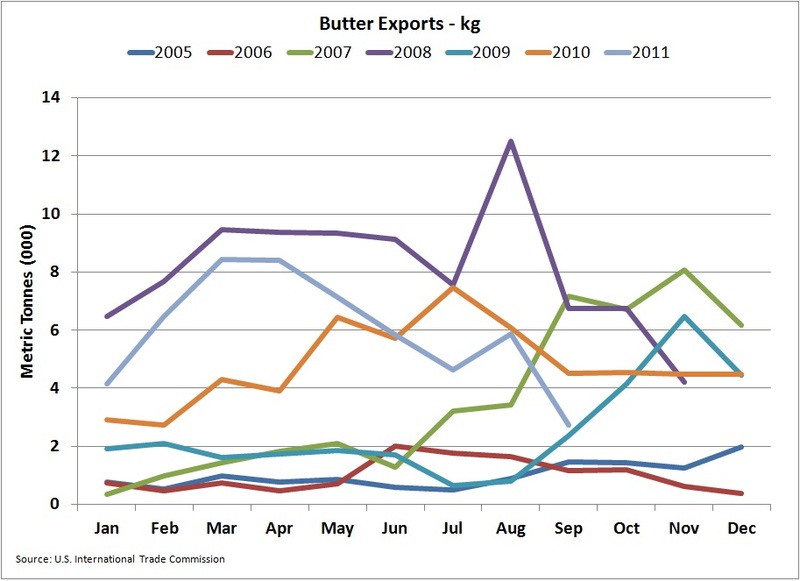 Of course, this will impact butter prices. 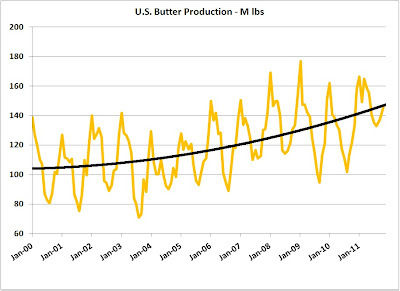 Butter production typically hits a low in August. As can be seen in the chart below, the 2011 low point was much higher than 2009 and 2010. With the higher level of production, it is not surprising that inventories are reaching more normal levels. 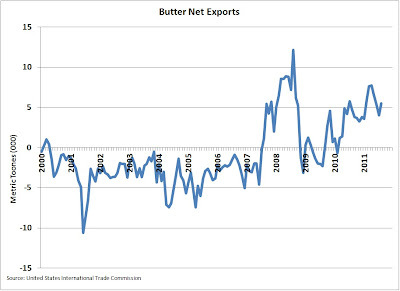 Butter net exports (exports less imports) remain positive, but below the 2011 peaks and well below the late 2008 record peaks. 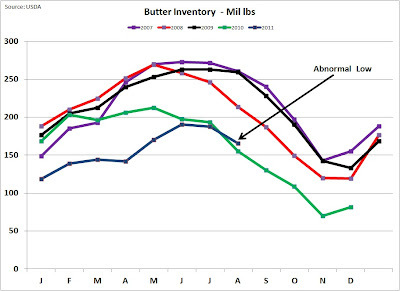 Primarily due to increased production, inventories have increased which has impacted butter and therefore butterfat prices. 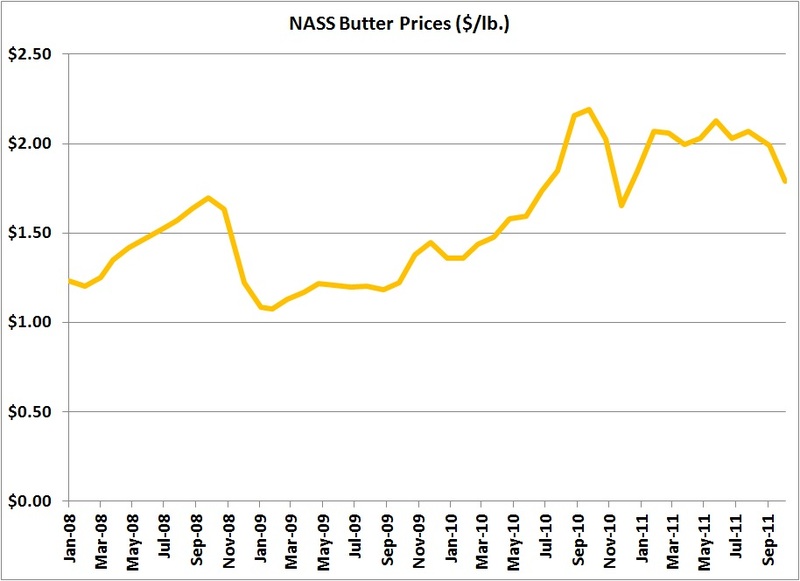 October's value of $1.88/lb was well below the $2.00+ prices seen earlier in 2011, but still above the historical prices. Cheese Inventories started a downward trend after two years of abnormal highs. 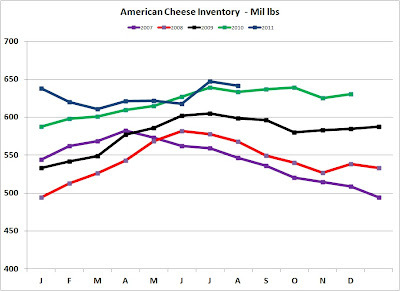 That leaves the inventories high, but headed in a corrective direction. It will probably take many more months to return to more normal levels. Cheese consumption continues to grow and exports remain healthy however, natural cheese stocks are still well above the trend lines and are therefore not putting pressure on cheese prices to rise. With the Euro weaker and dollar stronger, exports could be a weak link. 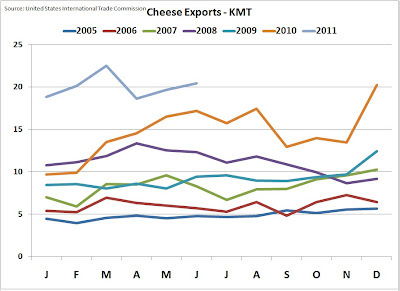 Cheese export reporting lags by a few months, but the chart below shows a softening in August. August is still a record for this time of the year, but the level is below the pace of earlier in 2011. For the month of October, cheese prices have remained strong although below prior months levels. 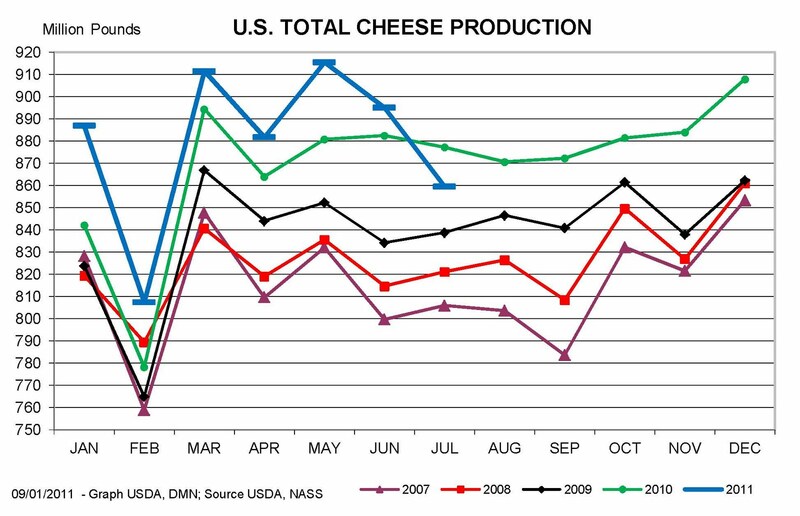 After a volatile period, it appears that the U.S. dairy products are returning to more normal levels of production and inventories. The most important parameters to watch are those impacting cheese prices. 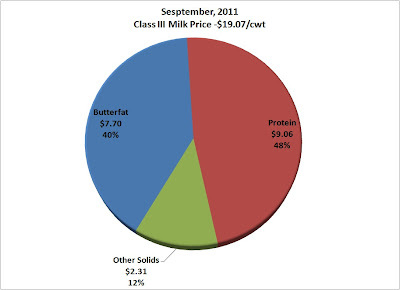 Butter prices have a minor impact on Class III milk prices. With Cheese inventories falling and a strong export program in place, cheese prices should slowly gain for the remainder of 2011, with a similar impact on milk prices. The September milk and component prices were announced September 30, 2011. While they were down significantly from August, they did not reflect the full impact of falling cheese and butter prices that have recently occurred. Class III milk fell 12%. from $21.67 to $19.03/cwt. Protein took the worst hit falling from $3.83 to $3.03/lb, a 21% drop. 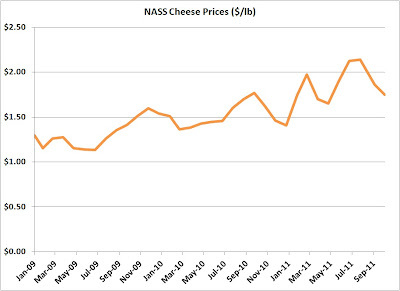 This reflected the change in cheese prices which fell from $2.14 to $1.85/lb as measured by NASS. It could have been much worse. 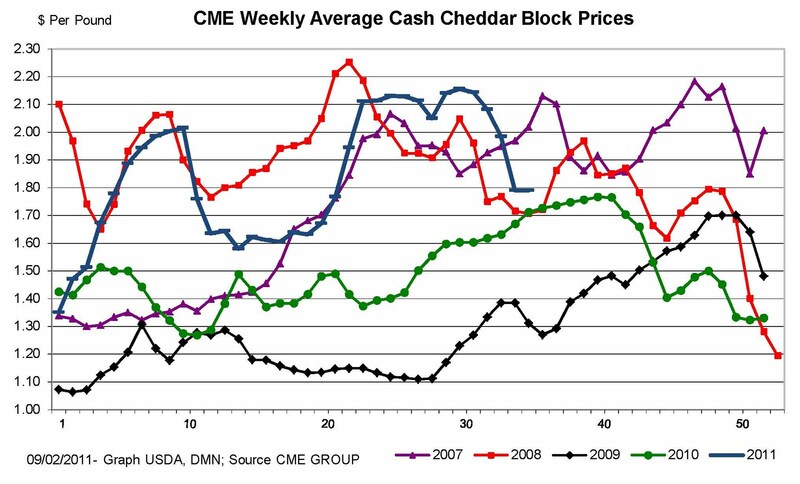 During this same time span, CME barrel cheese prices fell from a high of $2.13 in early august to a low of $1.64/lb toward the close of September. 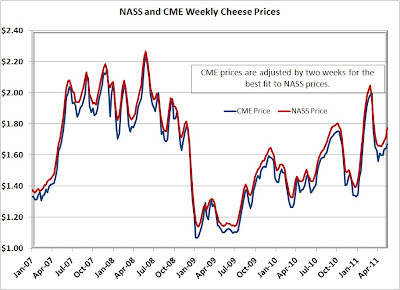 The NASS cheese prices which typically follow the CME prices by about two weeks have not followed as predictably as history would dictate. This will be covered in more detail below. The two concerns mentioned two months ago in this blog appear to be happening. The U.S. dollar has strengthened and exports are dropping. 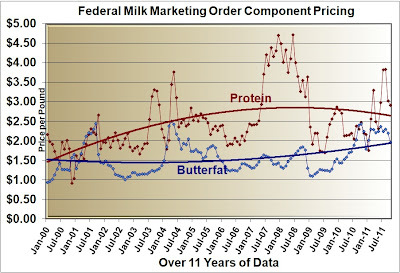 The change has brought back a more normal balance with payment for milk protein making up nearly half of the milk check. 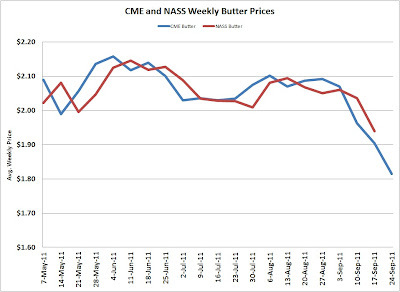 Since the beginning of April, the NASS and CME prices have been diverging. 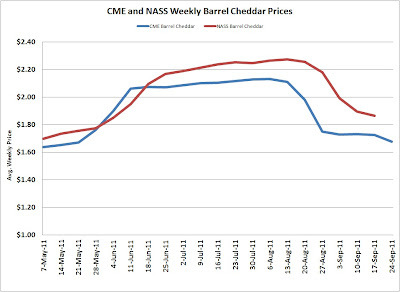 The spread between CME and NASS barrel prices is favoring a higher price as calculated by NASS. Because the NASS numbers are used to calculate the Class III milk and component prices, September milk prices did not have the full negative impact of the leading CME prices. In-other-words, the drop in the Class III milk price could have been worse. When prices decline, the NASS prices do not move as dramatically as the CME prices. 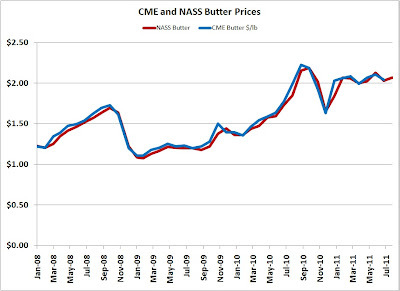 However, if the lower CME prices persist, NASS prices will follow as they did at the end of 2008. 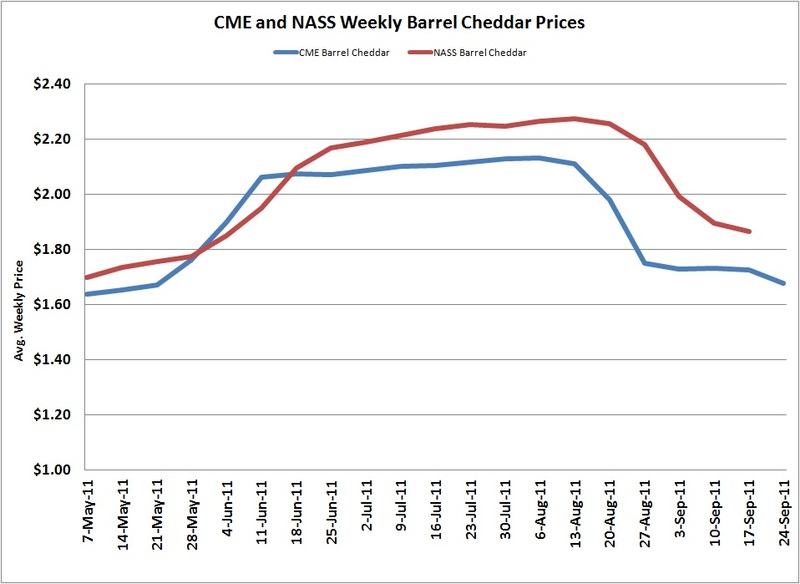 The chart below shows the comparison in CME and NASS prices when the CME prices are adjusted backward by two weeks. There is a 99.5% correlation. What's behind these lower prices? Continuing high inventories and falling exports. 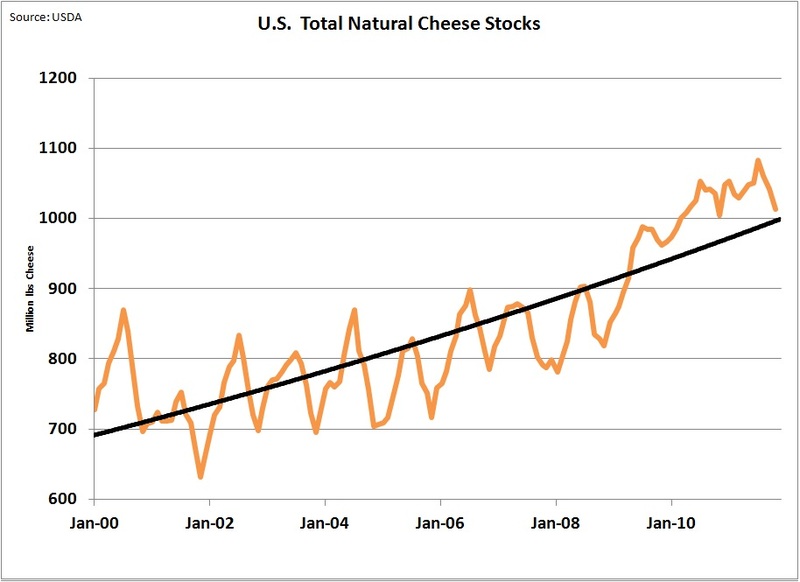 There are reports of dropping cheese consumption, but final data is not available. 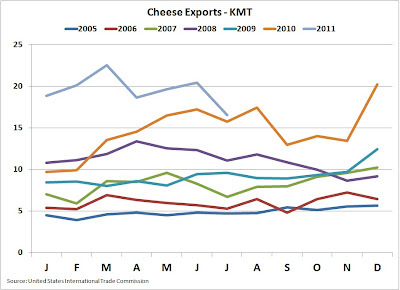 Unfortunately, the very strong export market we were enjoying has fallen in July, the latest month for which data is available. 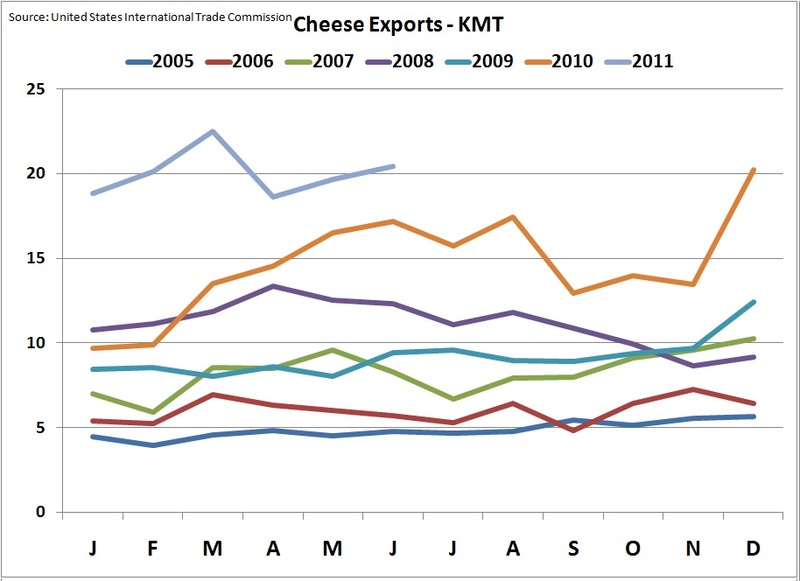 With the stronger USD, cheese from the U.S. is more expensive on the International market. The USD has strengthened relative to both the Euro and the New Zealand dollar. 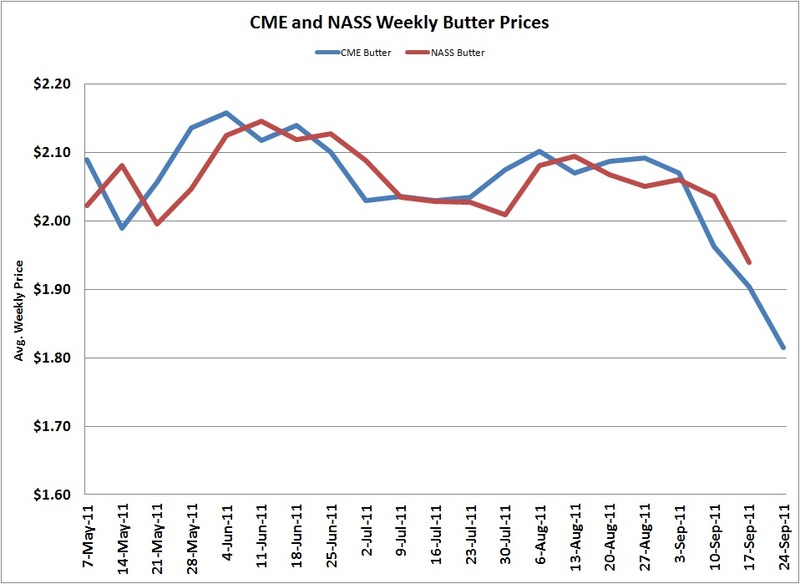 NASS Butter prices lag the CME prices by about 1 week, but with a very tight correlation. In recent weeks, that data reports from both sources is down significantly. When adjusted by one week, the tight relationship is even more obvious. 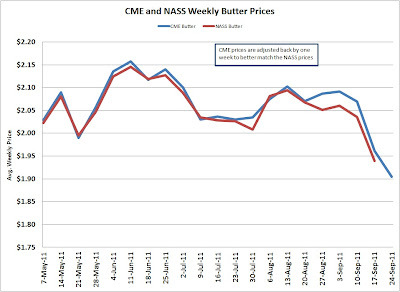 Based on this, NASS butter prices can be expected to fall in the next two weeks. 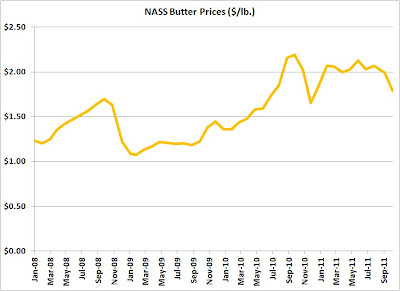 The butter price calculated by NASS for September was $1.98/lb. The CME price on the last day of September was $1.645/lb. 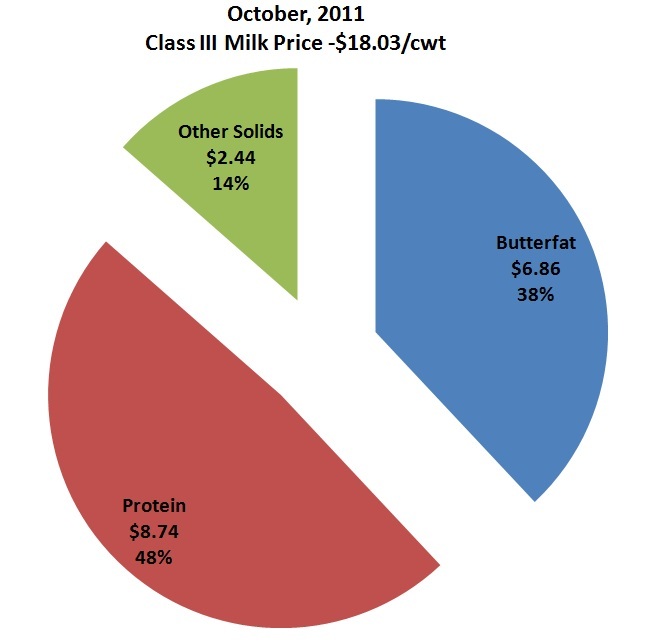 As butter prices fall, the impact on Class III milk is minimal. 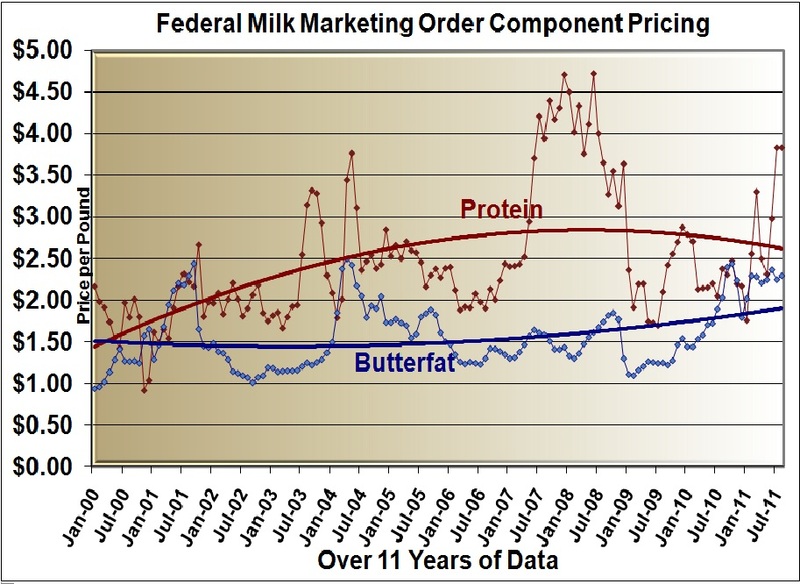 Falling butter prices lowers the component value for butterfat but increases the value for milk protein. This was explained in the August 8, 2010 post to this blog. Production of butter remains robust for the last 5 reporting months. 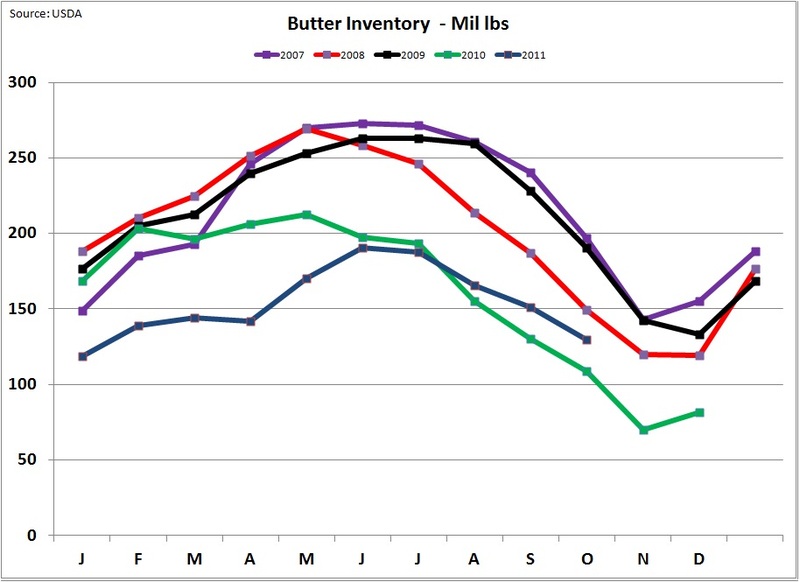 However, even with higher production, butter stocks remain very tight, but for the first time in 2011, inventories have exceeded prior year levels. 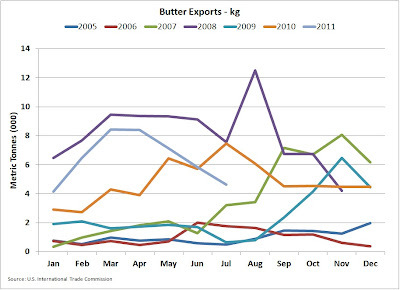 Similar to cheese, exports of butter have fallen in the most current month for which data is available. This data is through July only and the impact of the stronger USD is not yet visible in this data. The stronger USD will no doubt reduce butter exports. 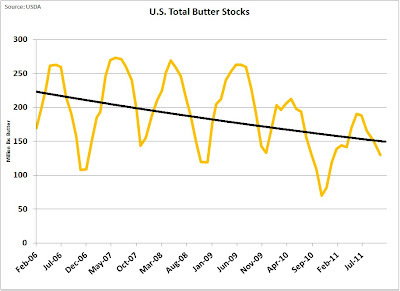 Based on the above facts and the trends, it is reasonable to see butter and butterfat prices continuing their decline. Based on the most recent trends, stronger USD, lower exports, higher inventories, and lower component prices, it is easy to predict lower Class III milk prices. The futures market sees it the same way. Their was a little good news for dairy producers at the end of September as NASS made some surprising announcements on corn. 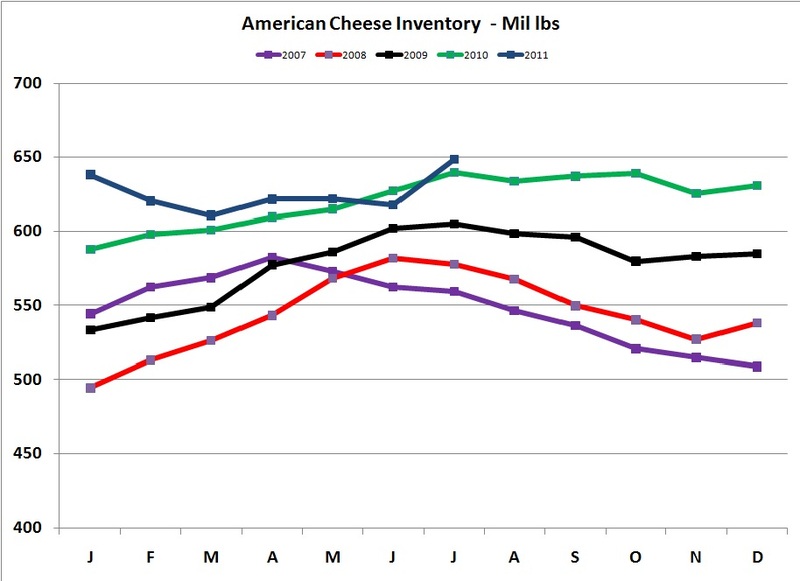 Inventories are higher than last expected and usage is down. This brought the CBOT price to under $6/bushel for the first time in many months. Class III milk and component prices for August were announced on Friday, September 2. They tracked very closely to the July prices. 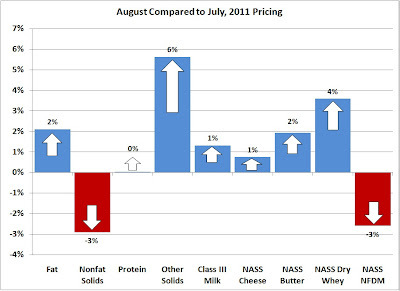 When compared to July's activity where the change was -5% to + 28%, August prices changes ranged only from -3% to +6%. 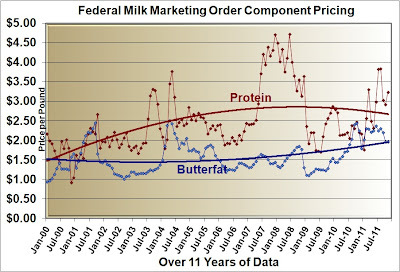 Milk protein remained nearly the same at $3.83/lb. 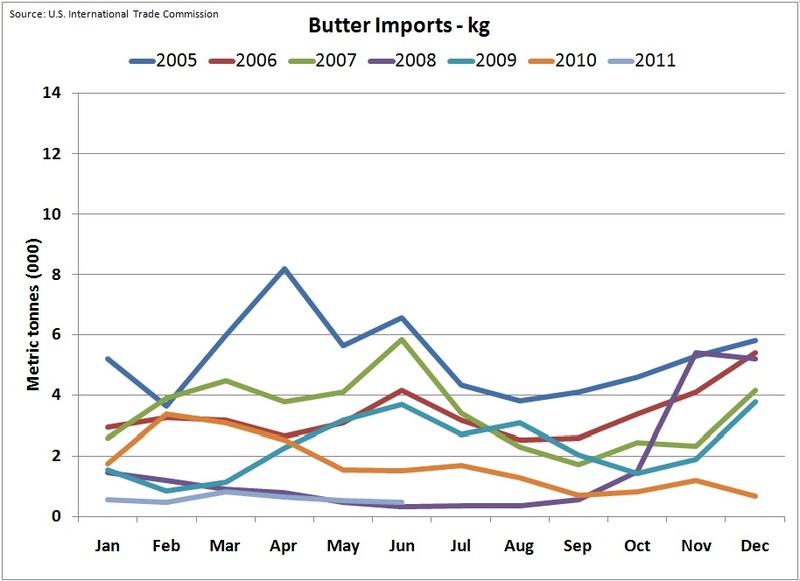 During July, all factors influencing butter prices remained stable and will be reviewed below. 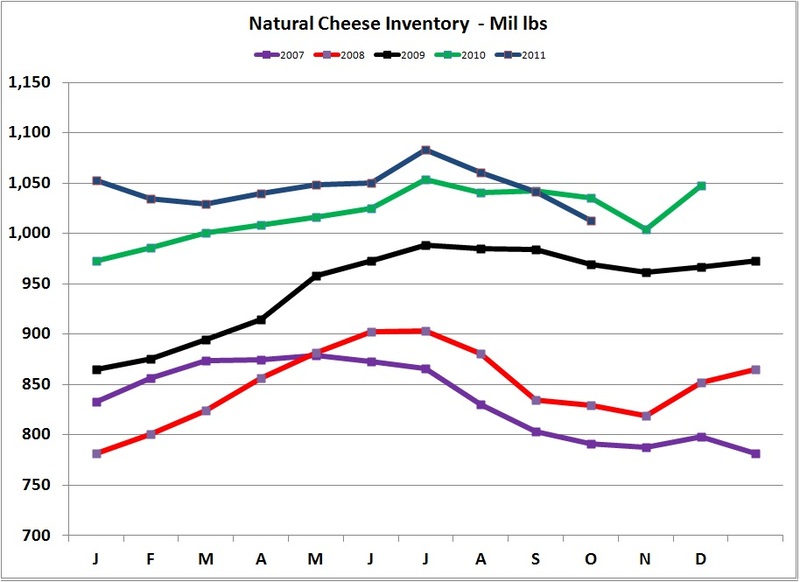 However, cheese production declined significantly and inventories increased significantly. 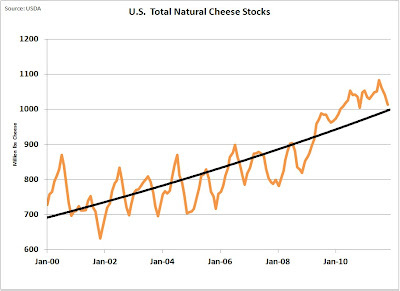 This has caused a very significant drop in the price of cheese on the CME. 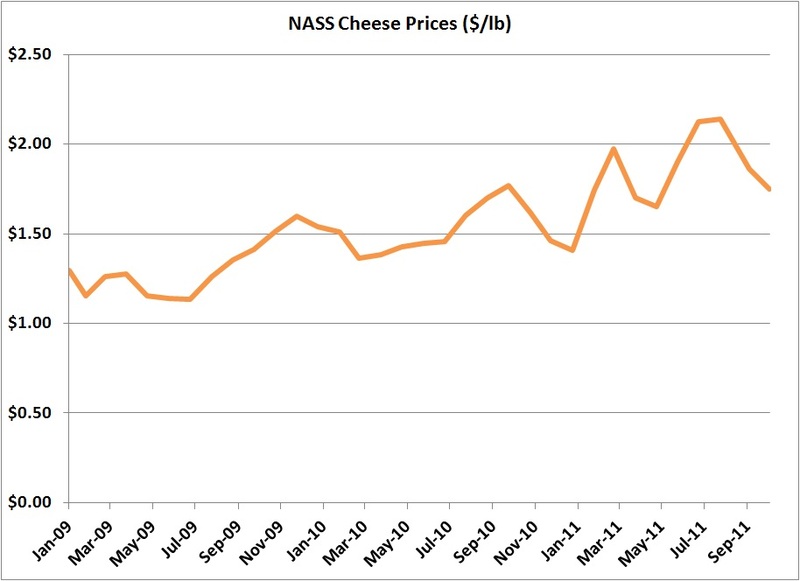 The NASS prices lag behind the CME prices by about two weeks, but so far the drop on the CME has not impacted the NASS cheese prices. Because milk protein prices are calculated based on the NASS cheese prices, there was essentially no change in cheese or protein prices between July and August. 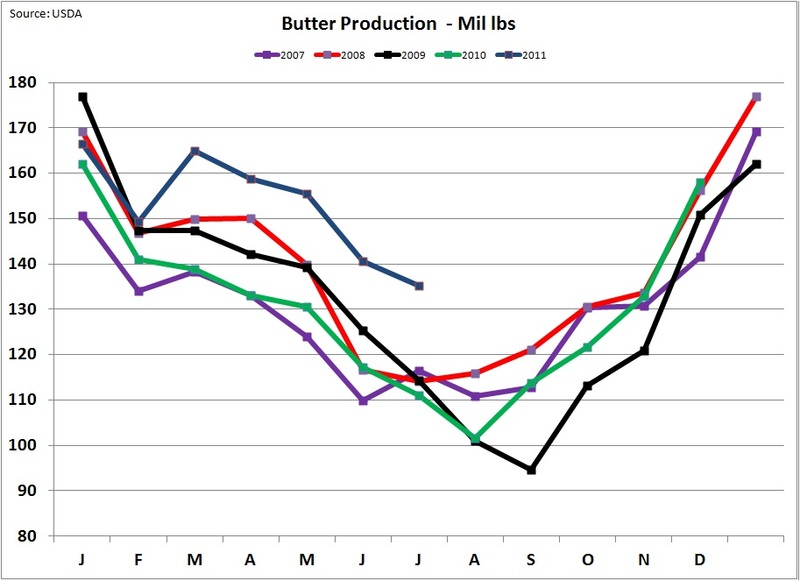 The long term graph of butterfat and milk protein prices shows amazing stability between July and August. 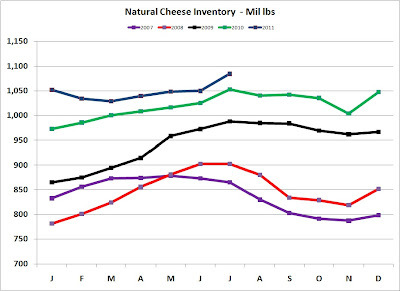 There was a lot of fluctuation in the cheese markets in the last three weeks of August. 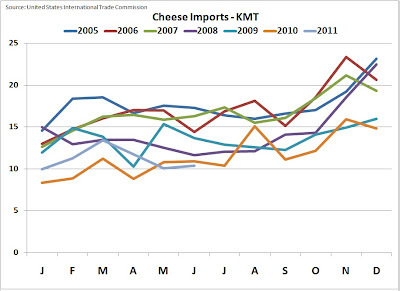 While the results can be seen in cheese inventories and CME pricing, the reasons behind the changes in demand for August cannot be analyzed until the August import and export data and domestic consumption information are calculated and published. 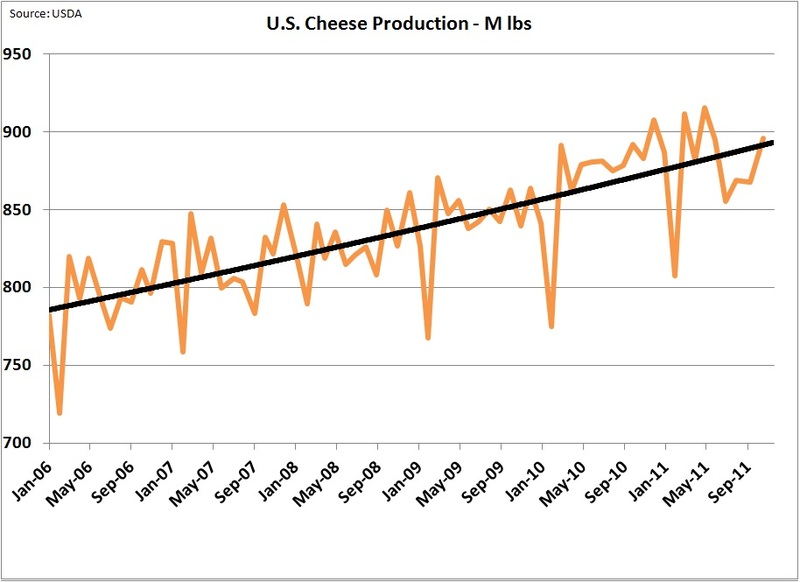 Cheese production dropped dramatically in July (August numbers are not yet available). 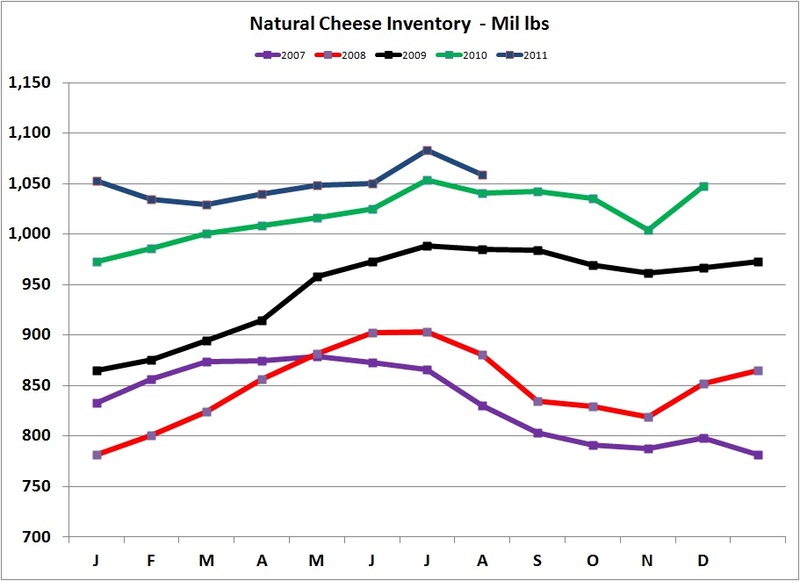 Cheese inventories of both processed and natural cheese increased significantly in July. With production down, inventories would be expected to drop, not increase. 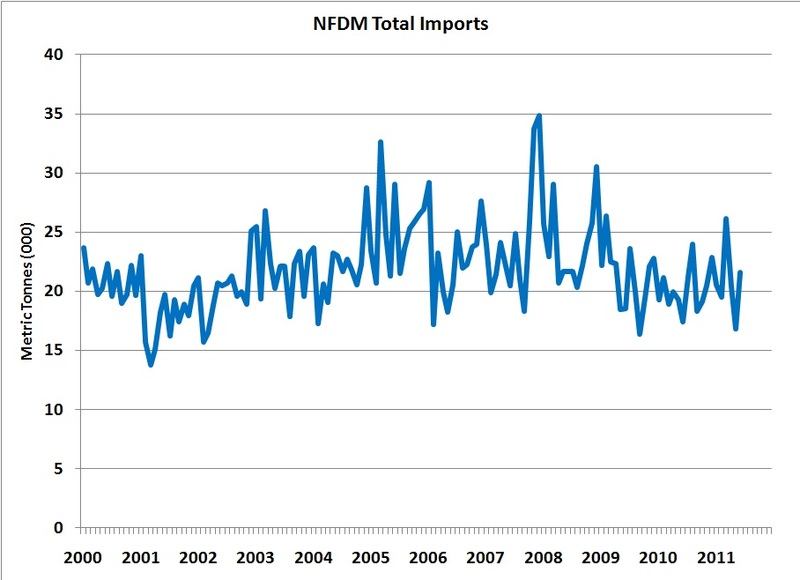 This means that the demand side has softened due to fewer exports, increased imports, or reduced domestic consumption. 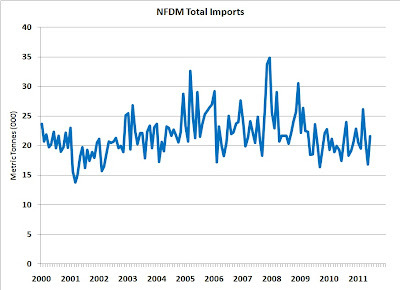 The most recent available data (June, 2011) for exports and imports does not show any weakness. Exports remain high and imports remain low. 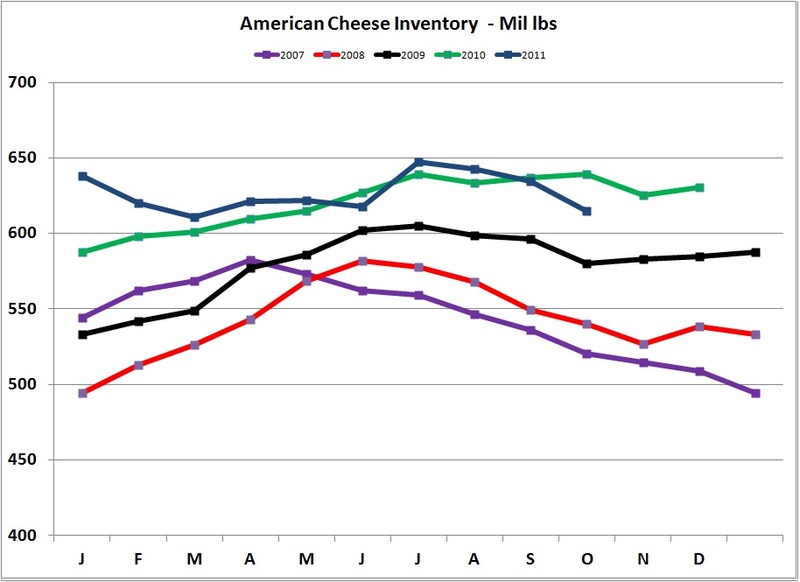 With the increase in inventories, cheese prices on the CME have dropped dramatically, falling from around $2.15/lb to $1.80/lb, a 16% drop. 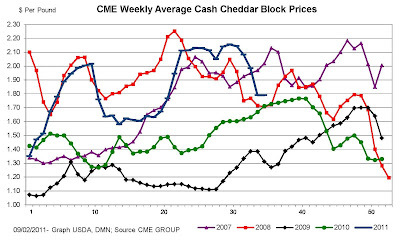 The chart below shows changes to Cheddar block prices. Barrel prices are similar. 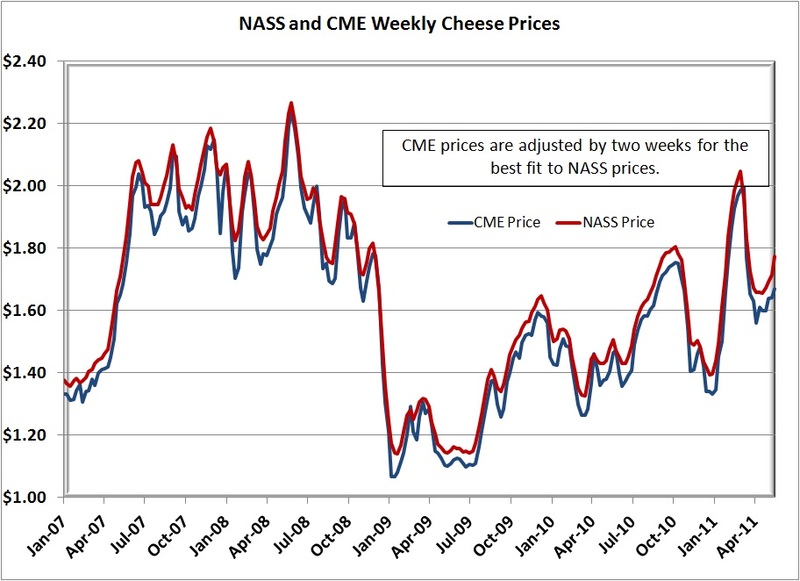 NASS prices typically follow the CME prices with about a two week lag. There is no reason to think that this will not happen in September. If NASS cheese prices drop 16%, the milk protein price will drop by over one dollar and the Class III price will drop by over three dollars. The best guess is that this will happen in September. 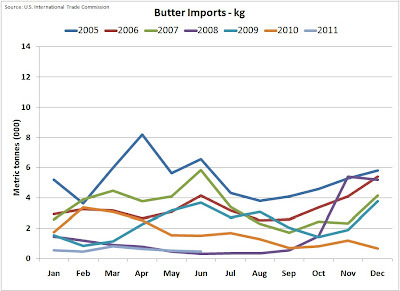 Very little is happening with butter prices. 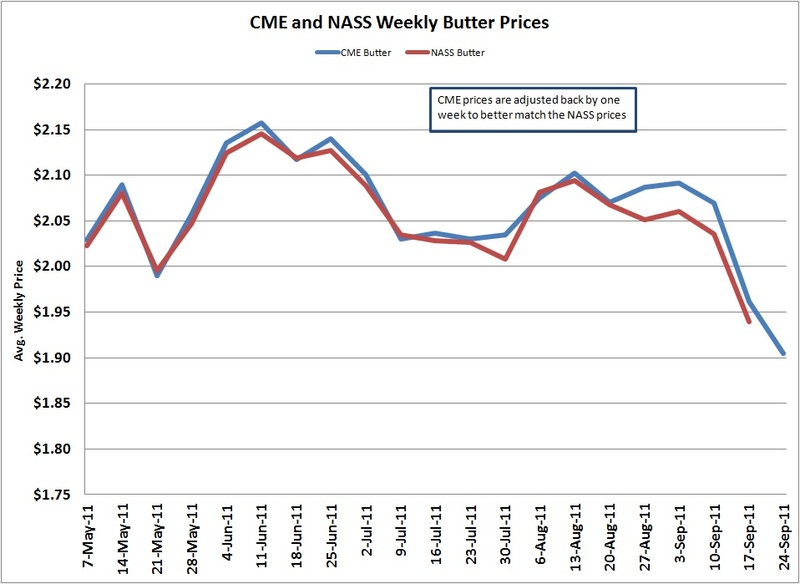 Prices remain very stable with both CME and NASS prices just shy of $2.10/lb. 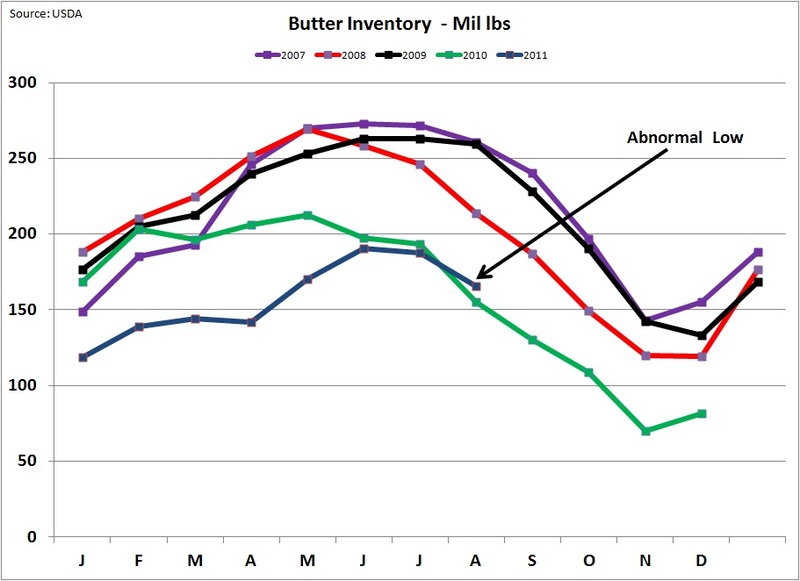 Butter inventories remain low with normal seasonal variation. Butter production remains above historical levels, although production did take a slightly strong dip in July. Exports remain reasonably strong, and imports remains low. Eventually, inventories will rebuild and butter and butterfat prices will drop, but this will take many months at the current production and demand rates. Nonfat Dry Milk is not typically discussed in this blog, because it has very little direct impact on Class III milk pricing. A review of the formulas was undertaken in a previous blog and can be reviewed at this link. 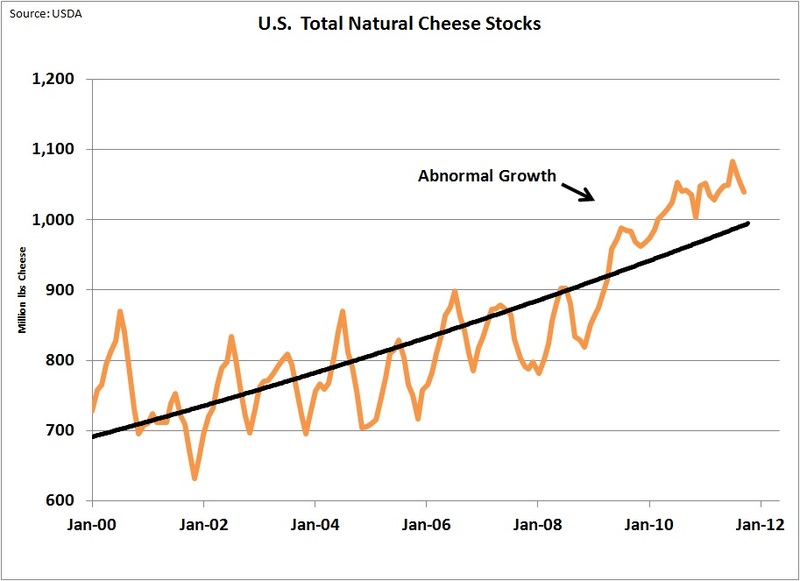 However, Nonfat Dry Milk does have an indirect impact by using milk that is then not available for cheese production. 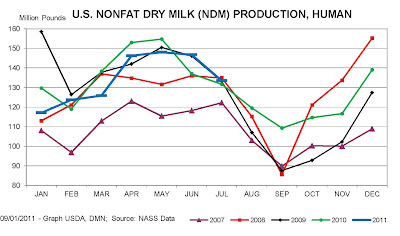 The Nonfat Dry Milk exports have been very strong and imports remained minimal. 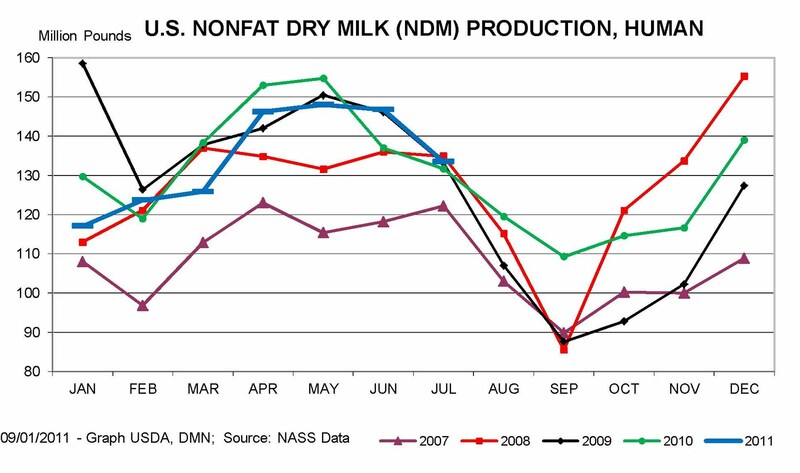 Nonfat Dry Milk Production has remained near "normal levels"
While nonfat dry milk exports remain a huge product for the dairy export markets, and those exports are healthy, they do have very little impact on Class III prices and milk checks. 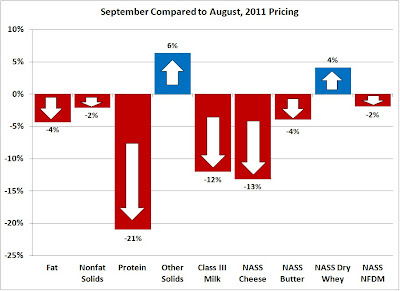 It certainly looks like next month will show significant drops in milk prices. However, the long term fundamentals of supply and demand appear to be in good shape. Exchange rates remain favorable for exports and with a reasonably healthy economic environment, long term prices should remain strong.